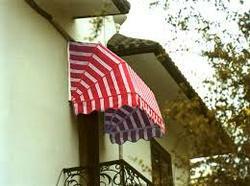 Our rapidly growing organization is offering a wide gamut of Window Awnings. Designed for both residential and commercial establishments, these awnings are ideal especially for hotels, restaurants, exhibitions, shopping complexes etc. Available in different patterns, our awnings are attractive, durable and easy to install. Offered products are examined under the supervision of our quality controllers.